Since AllSeated’s online network for planning events is a collaborative tool, caterers will find it extremely beneficial to offer their clients access to AllSeated’s state-of-the-art guest list. By collaborating with your clients within AllSeated, they will have the ability to build and manage their guest list for their event. Aside from offering total organization, there are many benefits to using AllSeated’s guest list. The ability for your client to keep an accurate count and listing of invited guests all in one place. A place to store mailing addresses for each guest as well as a section to keep notes. The opportunity to specify guests for multiple events such as bridal showers, rehearsal dinners and day-after wedding brunches. Guests can be grouped into categories (such as friends, family, colleagues) for even more organization. Assign meal preferences which can be easily listed for each guest, preventing the chance for error. Track RSVP’s and then arrange seating charts directly from the guest list. Generate reports in real time. As a caterer, the reports feature is extremely beneficial for many reasons. 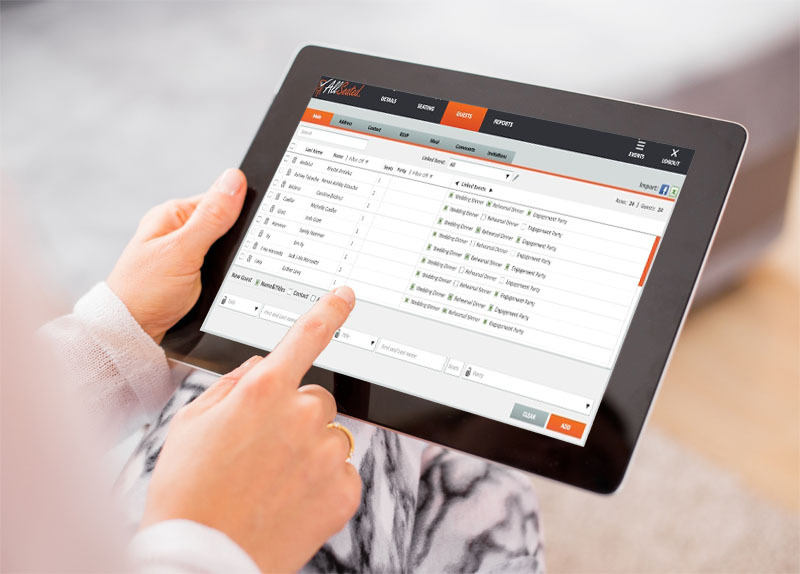 First, the ability to generate reports from the guest list allows you to stay up to date on your client’s guest count. If changes are made to the guest list and count at the last minute, you not only have access to the guest list but a new report can be generated to reflect the adjustments very quickly and easily. Generating reports from the guest list will also provide the venue with a venue guest list. The venue needs a venue guest list to assist them in understanding the total guest count and seating arrangements. A separate report can also be generated for the venue which can detail the floorplan, seating arrangements and full inventory of tables and furniture needed for the event.